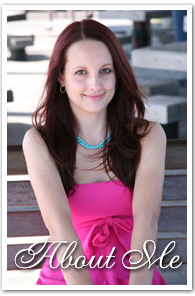 I've got to start this post by apologizing for the annoying gap between posts! I've been super-busy this week, which is no excuse, so here is a nice long one for those of you who've been so loyally keeping up with my little blog. 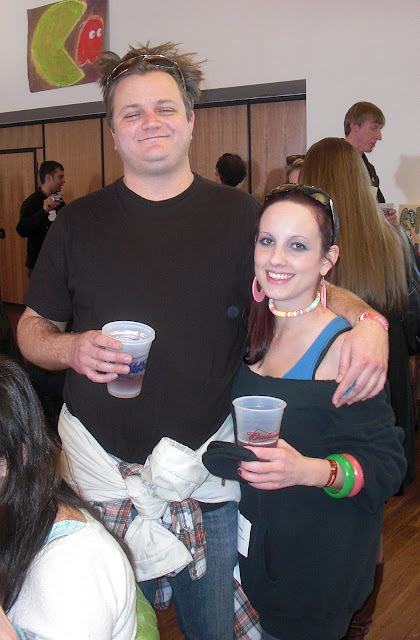 My buddy Tim celebrated his 25th birthday this past weekend. Much to my dismay, I had to work Sunday night, so I was unable to join our little group of friends at Charleston Grill. So, I promised him that our next day off together we would get together and cook a big feast. We didn't really have a plan for what we wanted to eat, so we shopped around until we found something we liked. 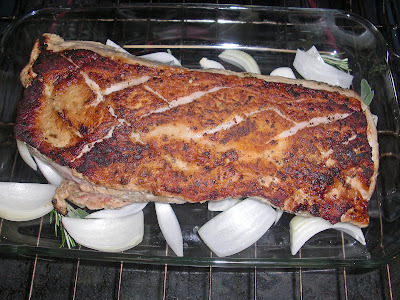 We ended up with a pork loin roast, which is kind of silly because the last time we cooked we did a pork roast too. But, they're good, and affordable, and can feed several people at once. 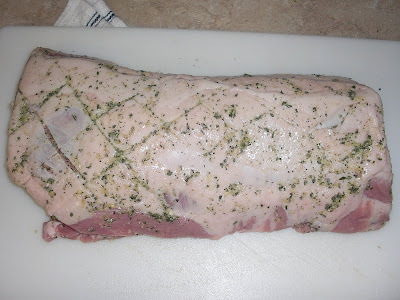 We decided to rub the roast down with a paste of finely minced garlic and rosemary, salt, and pepper. Then, we seared it to give it a nice head start on the browning process. So, in the oven it went, and we got started with a fun game of Apples to Apples, which always seems to get broken out when this particular group of kids gets together. 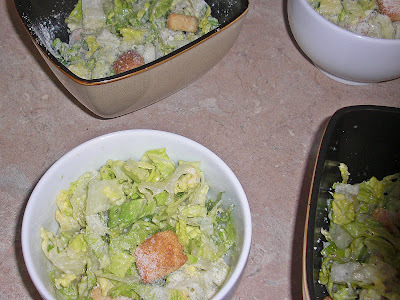 While everyone got started playing, Tim and I puttered around in the kitchen and whipped up some Caesar salads. 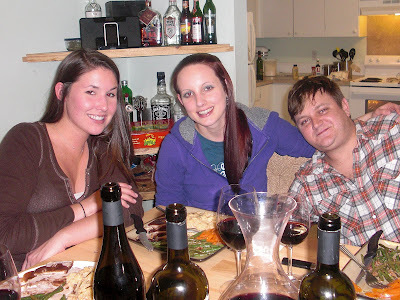 Tim's girlfriend, Amanda, got started on a kickass risotto, made with lots of chicken stock and wine. Tim was a big helper. 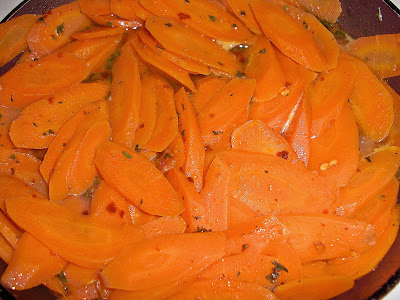 ...and some carrots with chile and mint, inspired by this recipe from the March 2010 issue of Bon Appetit magazine. We didn't roast them because the pork was roasted. Instead, we blanched them and sauteed them with butter, mint, and crushed red pepper. Finally, it was time to eat. 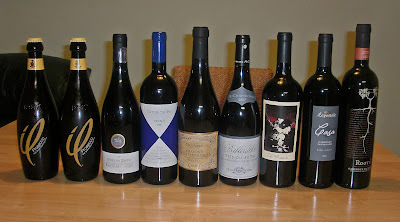 I'm not gonna lie, we managed to overcook the pork, because, well, you saw the wine lineup. 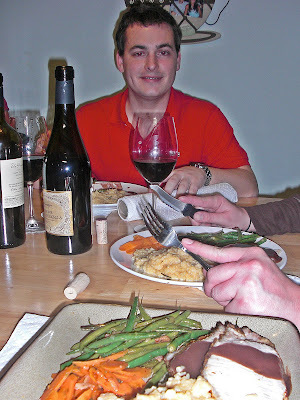 So we threw together a simple red wine-pan sauce-reduction-type-thing for a little moisture, and it tasted fine. Granted, the pork could have been a little more on the medium-rare side for us foodie restaurant kids, but the taste was there. 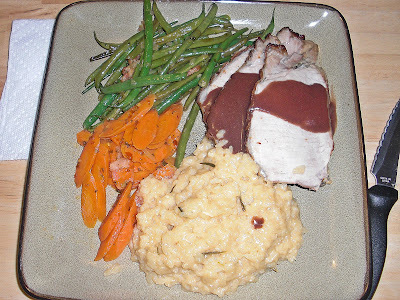 It was all good, but I've gotta give it to Amanda- the risotto was outstanding. She stirred it the entire time- I don't have that kind of dedication. But it was sooo creamy- and it didn't have a drop of cream or milk in it (one thing we forgot at the store)! 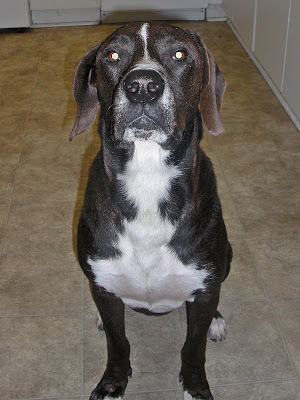 Let's not forget sweet Stella. She was so GOOD the whole time! Mmmkay so that's about all I've got. Cheers to Timmy on his quarter-century! 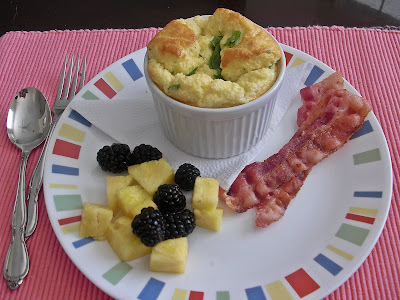 Ive been wanting to attempt a soufflé for a long time now. I hate to admit it, but I've been putting it off because, quite frankly, it intimidated me. 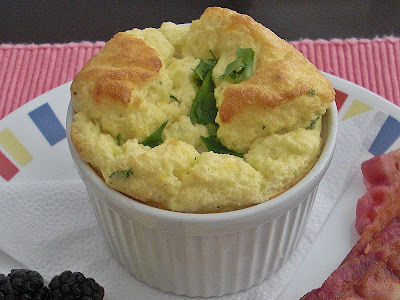 For those of you who aren't familiar with the soufflé, it is an egg-based dish that can be savory or sweet, in which whipped egg whites are folded into a base to give it a delicate lift when baked. 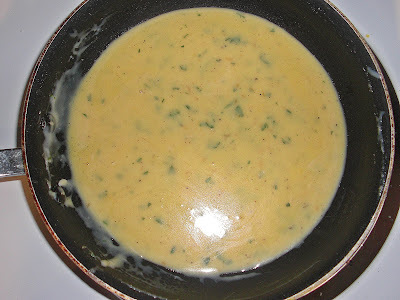 Melt butter in a medium saucepan over medium-low heat. Whisk in flour until well-blended and smooth, about 1 1/2 minutes. 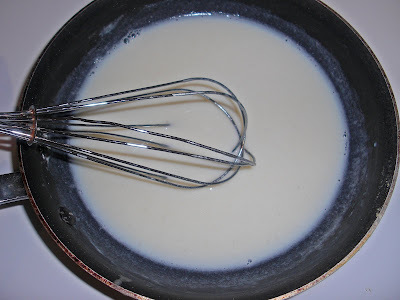 Remove the pan from the heat and slowly whisk in the milk. Continue to cook, whisking until the sauce is smooth and hot and has thickenened, 1 to 2 minutes. Season to taste with salt, pepper, and nutmeg. Add herbs and seasonings. 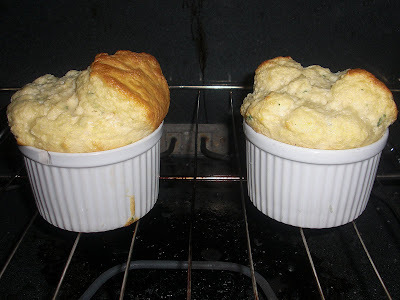 Preheat the oven to 350 degrees F. Generously butter soufflé ramekins and dust the insides with Parmesan cheese. Shake out the excess. 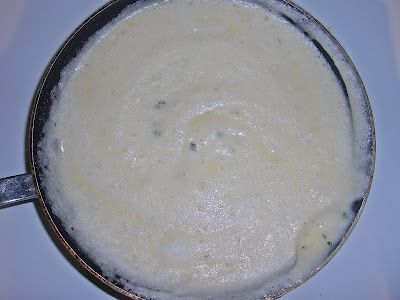 Bring the Béchamel to a boil in a large saucepan. Remove from heat and let stand for 30 seconds. Add the cheese, and stir well. Beat the whites until they are stiff, but not dry. Fold into the cheese mixture. 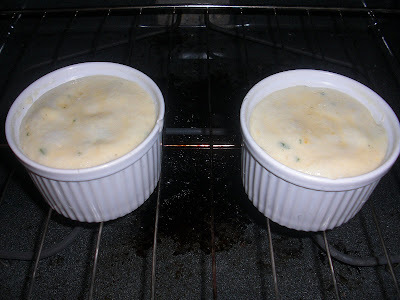 Pour into the prepared ramekin(s). Bake 25 to 30 minutes, or until risen and set. Not gorgeous, but they puffed! 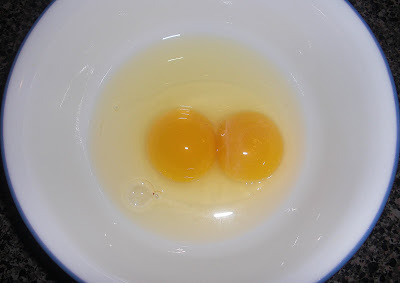 We had these for breakfast, with some bacon and fruit. These could be a lunch or dinner-type thing as well, just remember that the timing is tricky. I wish the tops had risen a little more evenly, but I don't know what I could have done differently to fix that. They tasted better than I hoped they would! Very delicate and light, and the flavor was really nice. Subtle but definitely there. I'll make these again- they really weren't that hard! First, I'm going to tackle chocolate ones for dessert. I'll let you know when it happens! My spread, moving clockwise: At 9'oclock, you see a veggie plate with cucumbers, carrots, and roasted almonds. Followed by grilled Haloumi cheese, couscous with chicken and parsley, pita bread in the black & white checkered cloth, hummus just below that, assorted olives, steamed artichokes with lemon garlic butter, and roasted cauliflower in the middle. 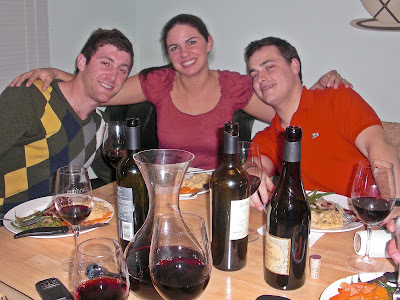 Brandon, his brother Justin, and I all had a lot of fun eating this dinner. None of the components were too difficult to make, but I did kind of get a little overzealous with the number of dishes I chose to make. I stayed busy with all the prep, but I like keeping busy with that kind of thing so it didn't bother me. First, the pita. 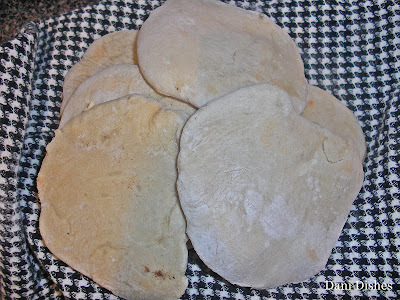 The recipe Michele chose was adapted from Flatbreads & Flavors by Jeffrey Alford and Naomi Duguid. I'm glad we've been working with yeast in baking class, because I've never really had the guts to play around with it at home. 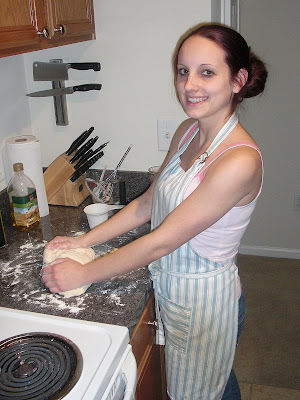 I think my class helped me not be too intimidated to try a yeast based dough at home. Kneading the dough. I look pretty. While the dough was proofing, I worked on all the other stuff. 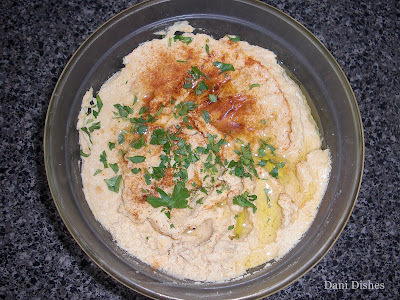 Hummus sprinkled with paprika, EVOO, and parsley. 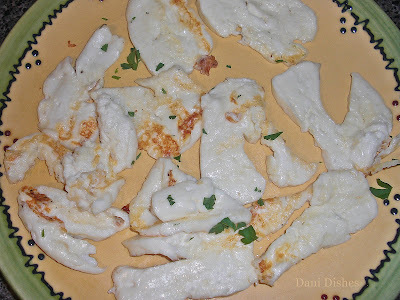 This was not the first Daring Cooks challenge to remind me of how much I need a food processor. 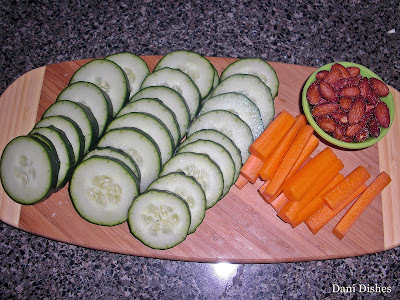 Cucumbers and carrots for dipping in the hummus, roasted almonds. 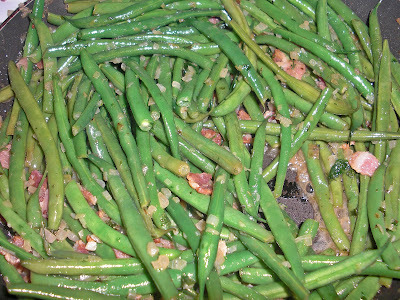 The veggies were nice, sprinkled with a pinch of sea salt. After the bread was finished proofing, it had to be rolled out and baked. This was when I got the hot stuff going. 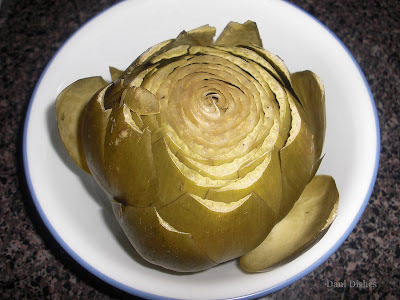 I absolutely loved this recipe for Artichokes with Lemon Garlic Butter. I've got it bookmarked, and I will absolutely make it again. The cheese wasn't the prettiest thing you've ever seen, but it sure did taste good. It had a nice saltiness to it. 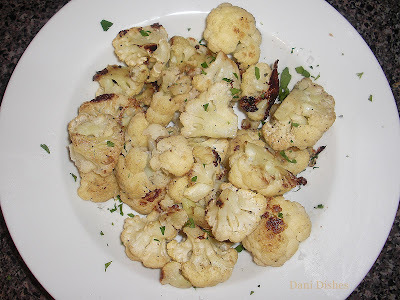 I definitely wouldn't consider myself picky, but believe it or not, until this year, I never thought I liked cauliflower. Finally, I tried some at work, and I can't believe how awesome it is! I mean, I've been craving it. So, I simply roasted this with some EVOO, salt & pepper, and it was delicious. Finally, my pitas. Mine didn't balloon up like so many other people's did (like they were supposed to), but they still tasted good. They definitely brought the meal together. Close-up view of the spread. 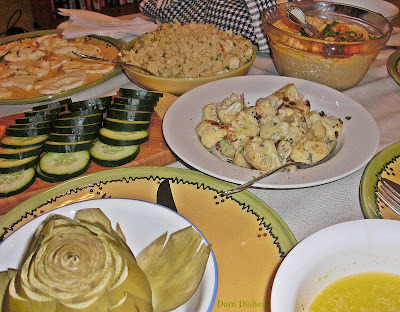 I didn't have a separate picture of the couscous (seen above in the middle, to the left of the hummus). It was more of an afterthought, really. I had some boxed couscous, and folded in some diced leftover chicken, lemon juice, and parsley. I also set out a little olive plate. This challenge was really fun. Brandon and Justin both devoured it, forgetting their largely carnivorous palates. I was tickled to tell them the entire spread, with the exception of the bit of chicken in the couscous, was vegetarian. 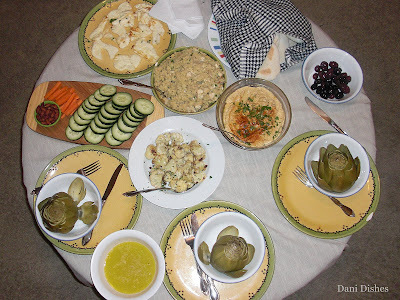 I will definitely make this kind of spread again, but next time I will probably just buy pita bread. It was nice to try making it, but the convenience stuff tastes fine, and would definitely cut down on messes and timing issues. 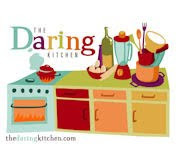 To see everyone elses' posts, check out The Daring Cooks's Mezze page. Over low heat, sweat the onions, celery, and broccoli in the butter, without browning, until they are nearly tender. Add the chicken veloute (or sprinkle the veggies with flour and add chicken stock). Bring to a simmer, and cook until the veggies are tender, and the stock begins to thicken, approximately 15 minutes. Skim the surface periodically. 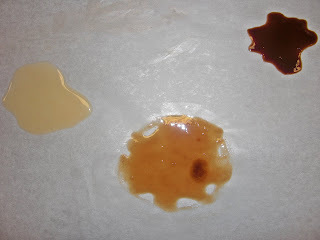 Puree the soup, then strain through a chinoise, if desired. Return the soup to the stove and thin it to the correct consistency with additional chicken stock. 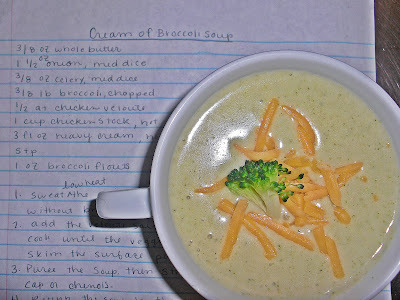 Bring the soup to a simmer and add hot cream and salt and pepper to taste. Garnish! *This was good- it was nice and thick, and I did choose to strain mine to give it a nice, clean texture. 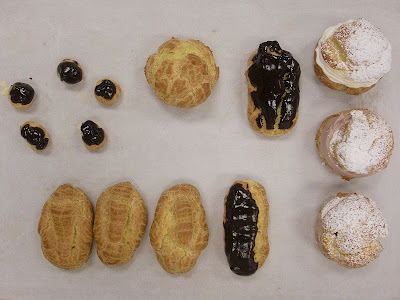 In baking class, we made Pate A Choux. From this dough, we made cream puffs, chocolate eclairs, and profiteroles. 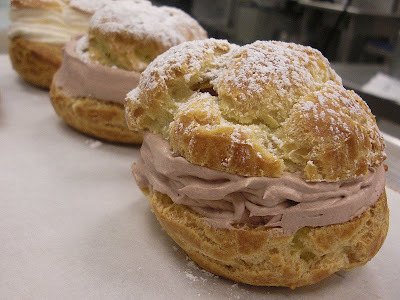 The cream puffs were filled with pastry cream, which was then topped with whipped cream (chocolate or vanilla). 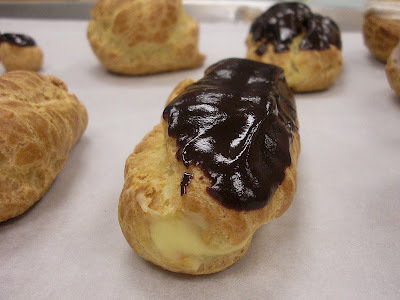 The chocolate eclairs were piped with pastry cream, and dipped in chocolate ganache. They were good, but really rich. 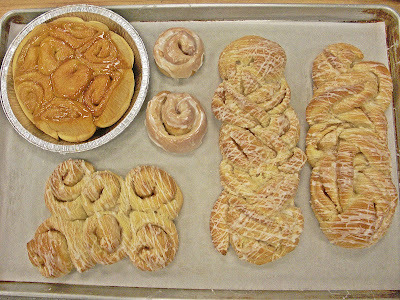 Culinary School Update: Minestrone, Foccacia, and Cinnamon Rolls! So, I need to post about school before I get too far behind to catch everyone up. 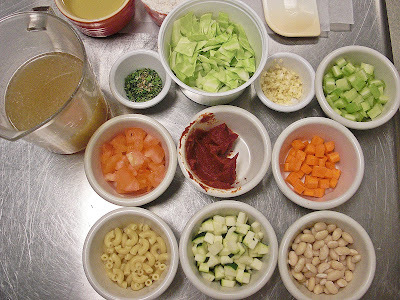 Mise en place for minestrone in cooking class. First, I'll go over my Culinary Arts class this week. We put together a chicken stock, and made minestrone in groups of two. While the minestrone was cooking, we made roux. For those who aren't familiar with what a roux is, it is a mixture of equal parts flour and fat (oil, butter, bacon grease, whatever) that is used to thicken things (like soup or gravy). We didn't use the roux to thicken anything, it was more like a skill development exercise. And by the way, yes, I dropped a little spot of brown roux into my blonde roux example :( . The chef said my blonde roux was just a teeny bit dark, but the brown roux was perfect. Made me want to make a New Orleans style gumbo or something. I've never actually had to make anything with a brown/black roux- it takes a lot of patience to get it that dark without burning. We're talking like 20+ minutes of constant stirring! 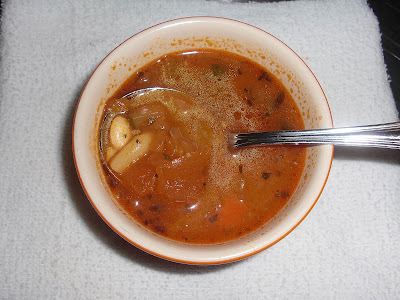 I still can't eat minestrone without thinking of sledding and snowmen. My best friend Brenna's mom used to make minestrone on every snow day. Now Brenna makes it for her own kids. This was pretty good, but it wasn't the same. Last week in baking class we made lean yeast rolls, cheddar cheese rolls and foccacia bread. 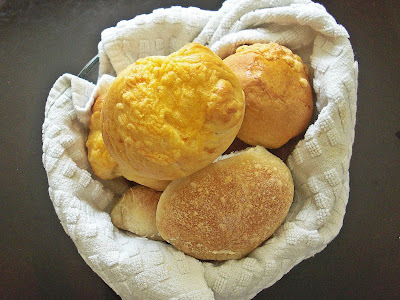 Cheddar cheese rolls and lean yeast rolls. These rolls were pretty good, but the foccacia bread was great. We turned it into pizza... mmm. 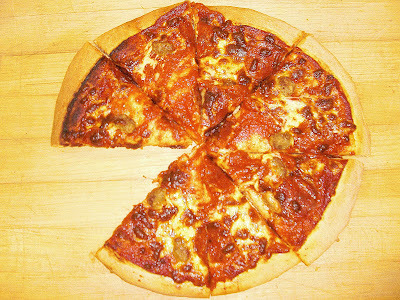 Here is my pizza. Yes, there is a piece missing. I was hungry and almost forgot to take a picture. 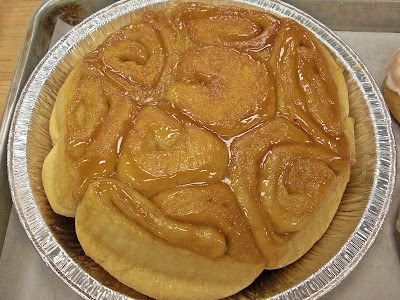 Okay, this week in baking class we made cinnamon rolls, and they were delicious! Cinnamon rolls don't usually get me going, but these were so soft and tender. Same dough, different shapes and decorations. The rolls in the pie tin were definitely my favorite. We put a caramel coating on the bottom of the pie tin, laid in the dough rolls, proofed and baked them. Then, when they came out, we flipped the tin so the caramel was on top. These make me drool like Homer Simpson. 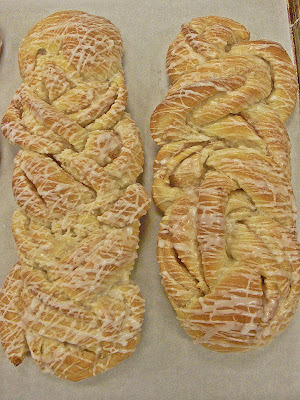 We made traditional looking cinnamon rolls, of course, and we also made these braided loaves. These were pretty fun and fairly challenging to make. Okay, well that's about it. That was a long one. Ya'll let me know how you feel about these culinary school posts - do they need changing? I don't want to go into too much detail because I don't want to bore you to death.